This trip will be a truly epic adventure as we hike around the Swiss Alps and take in scenery that is sure to be life-changing. We can't wait to experience this with you! All prices are per person, in Euro amounts, and are subject to change as services are provided by third party operators. It is a 90 minute drive and you should plan your flight and car service so that you are at the hotel before 5pm on June 15, 2018. This trip is an extremely physical trip and is a backpacking trekking trip from start to finish. Passengers are required to carry their own packs and there are no support vehicles. It is possible to leave some gear at the hotel in Chamonix as the trip begins and ends here. Night stops and routes may vary depending on weather conditions, daily group progress and availability. Flexibility is very important. Please note that this trip travels through remote and rugged Alpine terrain. Extremes of heat and cold may be encountered and the route involves some long and demanding trekking days carrying all your own gear. The altitudes along the route are between 5,000 and 8,700 feet. Most of the ascents are between 2400 - 3000 feet daily with similar descents too. The greatest ascent in a single day is planned for 4300 feet. The guide will accompany you on the treks; however, there are up to 12 people in a group and the trip is self-supported. There are no luggage transport or porters. Therefore it is important that you are a fit and confident walker over mountain terrain, able to manage ascents and descents and cross streams by yourself. Please realistically self-assess your fitness and suitability for this trip. We set off this morning with our guide after breakfast for our first day of hiking. 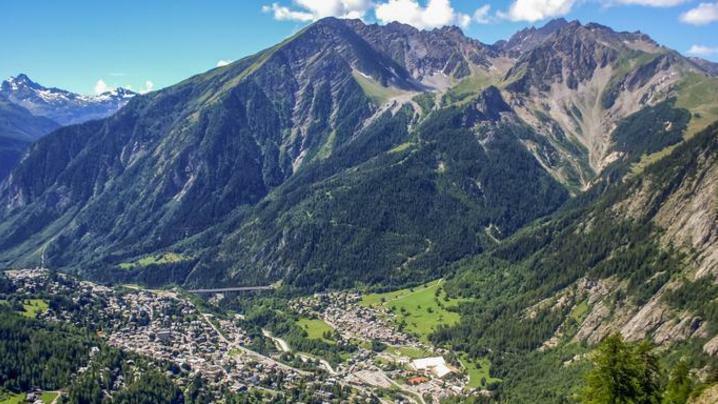 We'll take the bus or train to the village of Les Houches, where we begin with a cable car ride to Bellevue. From here on a clear day you’ll enjoy great views of the Chamonix Valley and the Mont Blanc Range, before beginning our hike to Les Contamines.